For this past New Years Eve we invited some friends over to bring in 2013! We weren't sure if we would all make it to midnight, but we managed. Of course will a little helpful entertainment from our 5 month old daughter. She had enough laughs and giggles for everyone that lasted the whole night. Well, until about 11:30... she rang in her first New Years Eve from the comfort of her own crib while we watched the CityTV countdown live from Calgary and Edmonton's Churchill Square. Besides our little bundle of joy, we had some good gluten free food to go around. It actually ended up to be a gluten free, vegetarian and mostly dairy free evening. 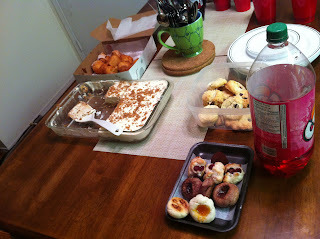 We had 8 people over, 4 of which are gluten intolerant and 4 of which are vegetarian. Once claims to be fake vegetarian because she eats fish, but we don't judge. Amanda and I supplied the mains, and everyone brought a little gluten free vegetarian something something to go with the meal. So what was on the menu? We started with Late July Organic Snack Chips (GF Certified) with Western Family Humus to munch on. Amanda made her famous "Free Free Free Free meal" which is a coconut curry slow cooker meal that is gluten free, dairy free, soy free and meat free. This was served with a side of rice. Another friend brought yummy roasted brussel sprouts and another a nice garden salad. Then came dessert, which is what everyone was waiting for. We special ordered gluten free donuts and gluten free jelly filled donuts from RioVida Bakery in the west end. Our friend also made her family's secret recipe (sorry can't share recipe) for a frozen pineapple dessert that we typically only get during the Jewish holiday of Rosh Hashanah. Amanda also had some extra chocolate almond cookies that are so good! We also had the opportunity to sample Alberta's own Screamin Brothers gluten free, dairy free ice cream. Yum! All in all, great time, with great friends, with great food. How did you ring in the New Year? Any recipes to share for our next potluck?